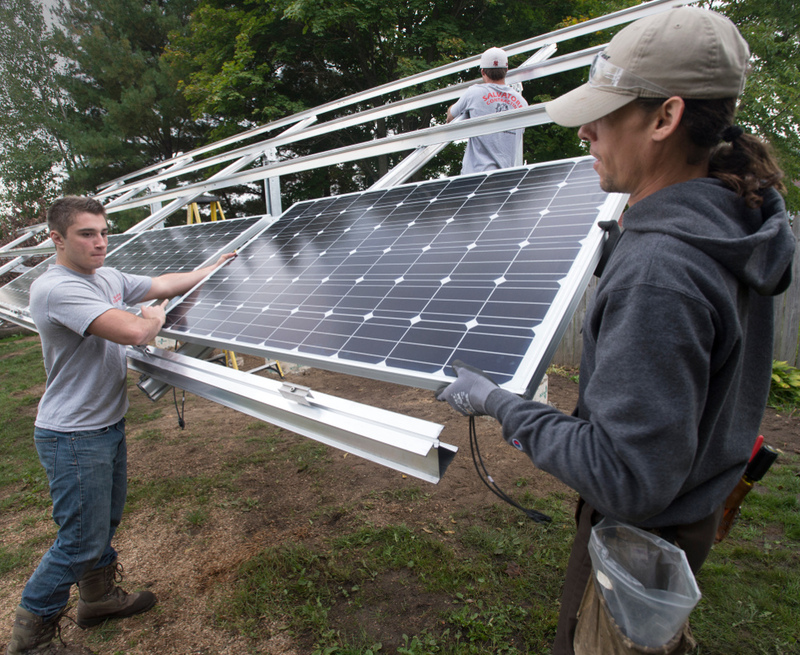 Crews install solar panels at a home in Thomas Township, Michigan in 2014. With the ongoing decline of solar energy costs and now a favorable ruling by Michigan regulators recognizing its ability to produce valuable energy during peak times, advocates say the sector is poised for growth here. Moreover, solar advocates at the national level have said Michigan could be a model for other states considering changes to “avoided cost” rates that utilities must pay independent power companies for their generation. On November 21, the Michigan Public Service Commission (MPSC) issued a final order in a case setting avoided cost rates for Consumers Energy, one of two major investor-owned utilities in the state. These are rates utilities pay independent power producers under the federal Public Utility Regulatory Policies Act (PURPA) of 1978, which was passed to encourage domestic renewable energy and keep costs low for ratepayers. The commission first opened the case in May 2016, and could set the tone for other utilities’ avoided cost proceedings, including DTE Energy. The MPSC’s ruling marks a significant transition in the way utilities procure energy and capacity from independent producers, which was traditionally based on the cost of new coal plants and favored sources like hydro, biomass and landfill gas. With the first update in decades, avoided costs are now based on the price of natural gas and, in the case of Michigan, recognize the value of solar during peak times like hot summer afternoons. The commission also increased the maximum size of projects that qualify for PURPA contracts, from 100 kilowatts (kW) to 2 megawatts (MW), with the ability for companies (or “Qualifying Facilities”) to set 20-year contracts, giving them additional certainty. While rates for each facility vary, Jester said avoided costs were broadly set at 6 cents per kilowatt-hour for hydro and biomass facilities and roughly 9.5 cents per kilowatt-hour for solar. While the MPSC hadn’t changed avoided costs since the 1980s, Jester said this marks a significant departure in the way solar is valued. Effectively, existing facilities will get more money per their nameplate capacity but “a good deal less” on a kilowatt-hour basis compared to solar, Jester said. “The existing Qualifying Facilities … are not irrelevant now. They’re going to struggle a bit with the economics of low natural gas prices,” he said. Margrethe Kearney, a Michigan-based staff attorney with the Environmental Law and Policy Center that also joined the case, agreed. Kearney and Jester said even potential tariffs on imported solar panels — a proposal under consideration by President Trump — may not hobble solar’s anticipated growth here. While some clean energy advocates support the MPSC’s decision, the case is being challenged by a coalition of existing independent power producers, mostly owners of hydro and biomass facilities. They say the lower avoided cost rate will decrease their operating revenue, and some may be forced to close. In a statement, the Independent Power Producers Coalition said the MPSC order could reduce some avoided cost rates by up to 40 percent. The group maintains that the MPSC decision discriminates against small power producers, and that it will appeal the decision. Jester said the impacts will likely vary by the type of facility when their contracts come up for renewal. While the independent power producers raised issues about how those facilities were treated during the process, the Institute for Local Self-Reliance praised the work of the MPSC, saying it could be a model for other states. While PURPA is a federal law, it’s up to the states to implement it, which has led to a patchwork of inconsistent approaches, according to the Institute. Kearney added that the decision still doesn’t fully reflect all of the avoided costs for a utility, such as line losses or hedging against natural gas prices with renewable contracts. However, she is supportive of the MPSC’s decision to revisit those issues in two years. Residents were divided over the 49-turbine project, which was awaiting the results of a local referendum scheduled for May 7.